I’d been hearing a lot of buzz about Vino Rosina lately and I visited the restaurant to check it out for myself. 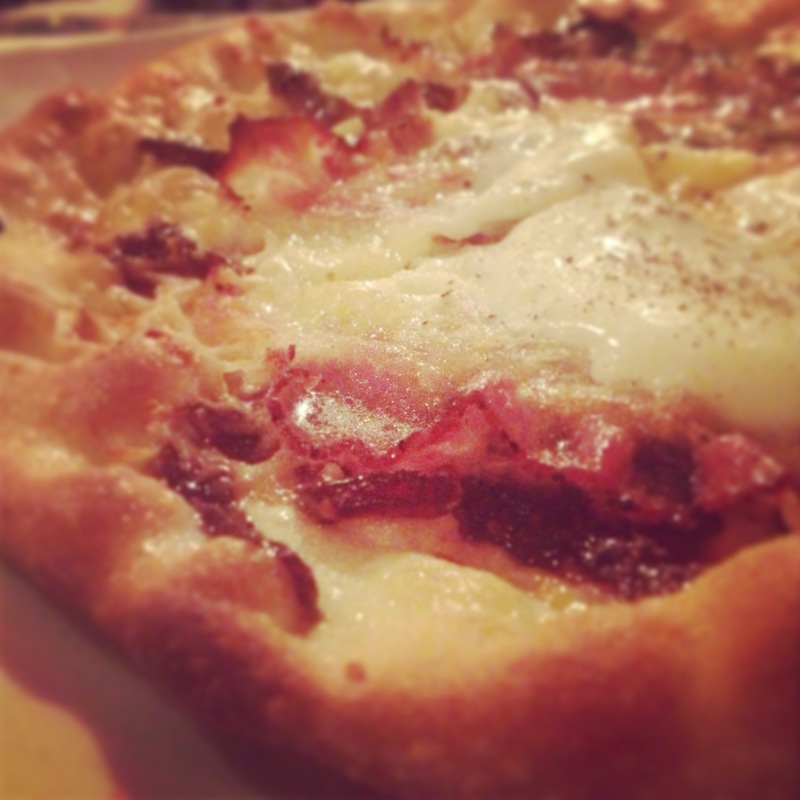 I had been once before for dinner and loved it. I went with a group of great friends and we shared cocktails, wine and a bunch of small plates to celebrate my birthday. We had such a great time. Lately, it seemed like some people had forgotten about this place – maybe because so many new restaurants have opened in Harbor East. A few friends have said, “Oh, I love that place…let’s go back!” So, I did. Ah, dinner at the bar. I like it a lot. It’s casual, you get to really know the person waiting on you and the people around you…and you can also get a fabulous meal. When I go to faves like The Food Market, Birroteca, The Wine Market, PABU, I love to eat at the bar. 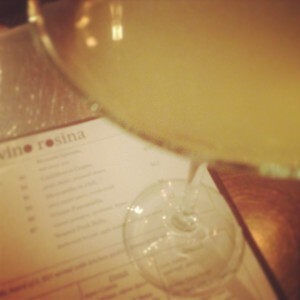 One of things I like best about Vino Rosina is that it’s a really approachable place. You walk in, grab a seat at the open square bar (get there early) and can take in the entire place. The people are friendly, the decor is modern yet warm and it’s not too big. And, wow, the kitchen is tiny, tiny…just ask Jesse Sandlin, the former executive chef who’s just returned. When she left in early 2011, her sous chef Sajin Renae took the reigns and ran the kitchen very successfully until she left to open Fork & Wrench in Canton. Then, owner Jim Lancaster recruited his former chef Jesse back – and she’s creating great things in that little kitchen once again. The bar program there is something special. That word…program. You hear it a lot now. You know, Johnny’s in Roland Park has a carefully planned (and amazing, thanks to Lindsay DiFabbio) “coffee program.” Woodberry Kitchen has an impressive “cocktail program.” So, yeah, that’s the phrase everyone seems to be using. Having a program just means the place takes it seriously…they’ve done their research and we patrons get to reap the benefits. They make liquor infusions in house – I tried the ruby red grapefruit vodka – very, very good. Next time, I think I’ll get a Salty Dog – ruby red grapefruit infused vodka, cointreau, dash of simple syrup, sea salt rim. Sounds amazing. Also, the Crotchless Dirty Martini – but I’d have to whisper it. (I’m a nerd.) Other infusions include Meyer lemon gin, carrot cinnamon bourbon, honey crisp apple rum and cucumber vodka. The wine list is always growing – currently about approximately 140 by the bottle, 50 by the glass – and I need to fess up and say that I rely on the pros to guide me here. (But, I’m learning.) 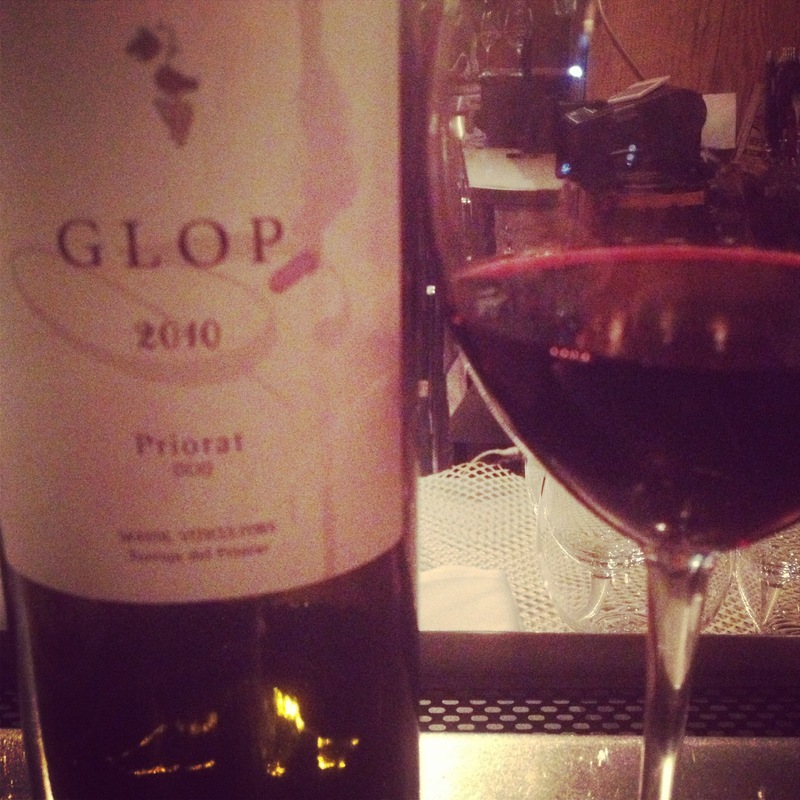 Jim suggested that we try the Glop Priorat from Spain, a blend of Garnacha, Syrah and Carinena. The nose on this wine gave us scents of plum and blackberry and when I tasted it, it was full-bodied and smooth. I’m told it would go well with the chorizo pizza at Vino Rosina. And while I tend to gravitate toward whites, I’m learning so much about pairing wine (and beer!) with food. Thank goodness for those pros – ask for help. You’ll be glad you did. And while I really do like wine, I adore beer. And, my growing beer knowledge is thanks in part to two people in particular. First, my friend Chip who is a huge beer enthusiast and blogger. Most times when I go to his house, I have a beer I’ve never tried. And always, always in a GLASS. He’s taught me (without being snobby about it) that it’s usually better that way. And the other beer guy in my life? Jed Jenny at The Wine Source. I’ll go in and he’ll suggest things he thinks I might like based on things I’ve enjoyed in the past. (Carey Williams in the wine department there is also a hugely helpful guide!) Jed knows I’m a Belgian Ale fan…so, he’ll steer me to beers in that style and also some that are close to it…or get me to try something completely different because he’s so excited about something they’ve just gotten in. Love that. Also, Baltimore has some really great places like Of Love & Regret, Birroteca, Brewer’s Art, Mahaffey’s, etc, where I can always try something new. But…I have to admit that when I go to Birroteca, I often make one of my beer selections an Ozzy. (I like it better than Resurrection – sssh!) That beer just makes me happy. They have a nice beer list at Vino Rosina – everything from that delicious local fave The Brewer’s Art‘s Resurrection Ale to Gonzo Imperial Porter from Flying Dog in Frederick to Hitachino Nest White Ale from Japan. Prices run from $2.00 for a can of Natty Boh on up to $20 for a 25oz bottle of Estrella Damn “Inedit” – a Spanish beer that was specifically created to be paired with food. So, there’s something for everyone in between. We went for cocktails and wine…but I spotted several beers I’d like to try. As for the food, the menu is set up in sections of starters and snacks, cheeses, odd bits, chilled and raw, from the oven and flatbreads. My friends and I chose something from each section. Glad we did! I especially liked my first taste of pork jowl – it was on a delicious flatbread pizza with onion jam (yumm) and a fried egg. As much as some people say food topped with a fried egg has jumped the shark, I highly disagree. Love hitting that yolk and seeing it coat anything in its vicinity in that gorgeous, deep yellow (orange = even better) goodness. Happy. Girl. One thing I remember vividly from my birthday dinner there a few years ago was the cheese course. We asked Jesse to choose for us. She was so happy to share some of her faves with us – you could tell how much she really enjoyed it. And this time around, she did not disappoint. My favorite was a goat cheese called Bonne Bouche from Vermont – bright, earthy deliciousness. I thought about that cheese for days. 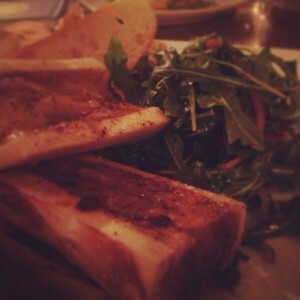 And I love the housemade crostini it’s served with – light, thin but not too delicate. 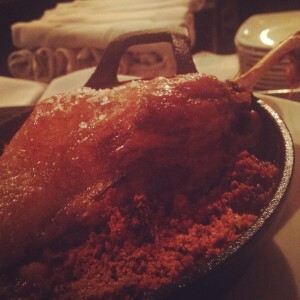 The Bonne Bouche would also be really good with crusty bread. Side note…as I sat in Artifact Coffee writing this post, I ran into Adam from the cheese shop at The Wine Source and he informed me that they carry Bonne Bouche all the time. How had I missed this? When I researched it for this piece, I was like…duh! I’ve seen it there a million times. Oh and p.s. I love my hood. My friend got the Zahradka Farms roasted chicken – it’s served over a panzanella salad, pumpkin with cornbread and of course, jus. I love a good jus…all of the juice and flavor of the chicken and you can DIP your chicken in it. Oh, my. I’m a big fan of really good roast chicken. 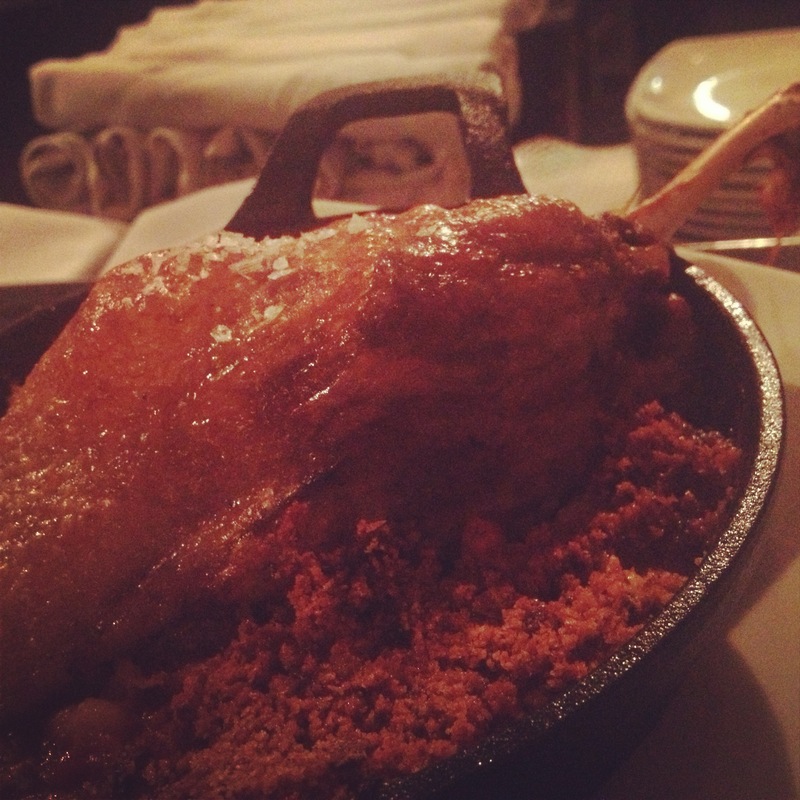 I make it a lot and Vino Rosina’s was very, very good – juicy inside, perfectly crispy skin outside. Yum. The dessert menu is tight – only four items – but they all sounded quite good. 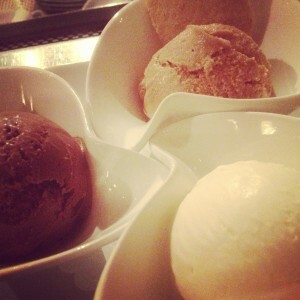 We got three flavors of ice cream and sorbet – Mexican chocolate, crème fraîche and coffee. While they all were quite tasty, I could have eaten a big sitting-on-the-sofa sized bowl of the coffee ice cream. Next time? Maybe the lemon meringue trifle? Or the pot du creme? Chocolate Irish coffee? Please and thank you. 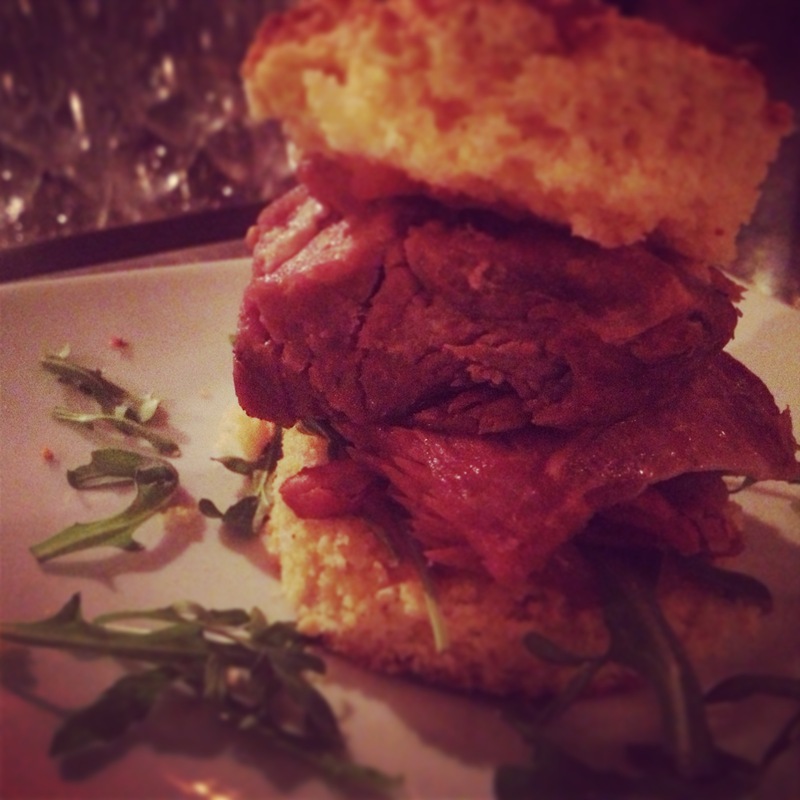 I’m definitely going back soon – definitely for brunch (Sundays 12-5). I hear it’s pretty amazing. Here’s the list of weekly specials – there’s an industry night, 1/2 price wine night and more. Vino Rosina’s owner Jim Lancaster also runs Rosina Gourmet – a very successful sandwich shop and catering company. Visit them in Canton and Downtown.